"Tangy, addictive, Asian pasta salad. Great for lunch boxes! Instead of chili flakes, you can add 1/4 teaspoon of chili paste to the whisked dressing ingredients." Fill a large pot with lightly salted water and bring to a rolling boil over high heat. Once the water is boiling, stir in the Chinese noodles, and return to a boil. Cook the noodles uncovered, stirring occasionally, until they have cooked through, about 5 minutes. Drain well in a colander set in the sink. Rinse the noodles with cold water several times to chill, then drain again. In a large salad bowl, whisk together the ketchup, sesame oil, soy sauce, brown sugar, kosher salt, and lime juice until the brown sugar has dissolved. 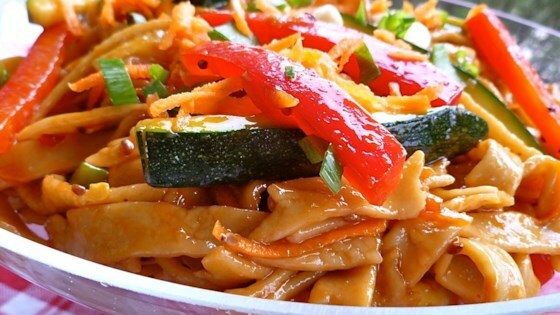 Place the noodles, green onion, carrots, zucchini, red pepper, sesame seeds, and red pepper flakes into the bowl, and gently toss to thoroughly mix the salad and coat with dressing. Chill at least 2 hours before serving. Very tasty, I used soba buckwheat soba noodles instead which are easier to find and it was very very tasty. Good as a side or main! Made this with whole wheat spaghetti noodles since it was all I had and it was even better the next day for lunch. I could handle a little more heat. The sesame flavor really flows throughout this dish. Next time I will use the suggestion of chile paste instead of red peppers so it has a more even spice.